Nordic Walking by definition is “Panaerobic”…some estimate that 90% of one’s musculature is involved. Whatever the amount Dr. Schwartz defined it as basically any movement activating all 4 limbs and as much muscle as possible. It’s a nice alternate day exercise for me – I find it works well doing HeavyHands one day and this the next. HeavyHands really works the shoulders and “lifting” muscles. As the arms go overhead they really get the heart pumping. Nordic walking works in a slightly different way, moves the “lifting muscles” of the arm and shoulder with light resistance and gives more work to the muscles required to “push off” as the body is propelled forward. What Nordic walking ISN’T is a Longstrength exercise. By Schwartz’ definition they were rhythmic calesthenics that involved all limbs and can be done for time, not just “reps”. I also don’t like the lack of hip and quad action that upright walking alone gives. That’s where a Nordic Longstrength move comes in for me. Basically while standing with arms front, I keep my arms ahead (usually more straight than shown) and sink back into a hip hinge. The return to standing is by a movement that resembles a kettlebell swing, i.e. a hip thrust while – to one degree or another – using the lat muscles to pull upright as well. It’s a great posterior chain exercise and lat exercise. I got the idea from “gruntbrain” and his poles with “T” handles and from kettlebell swinging. Though it can be done as a braced knee bend, in my opinion the hip hinge and lat action keep it quick paced and easier on the knees. Currently I use it to fill in gaps on the walk when I’d otherwise be inactive for some reason or if my path on a given day might not have much up hill work. Now that I’ve found my “groove” in the exercise (doing it as a hip hinge instead of a squat made it faster and more enjoyable), it’s time to ramp up some reps and see how they go. 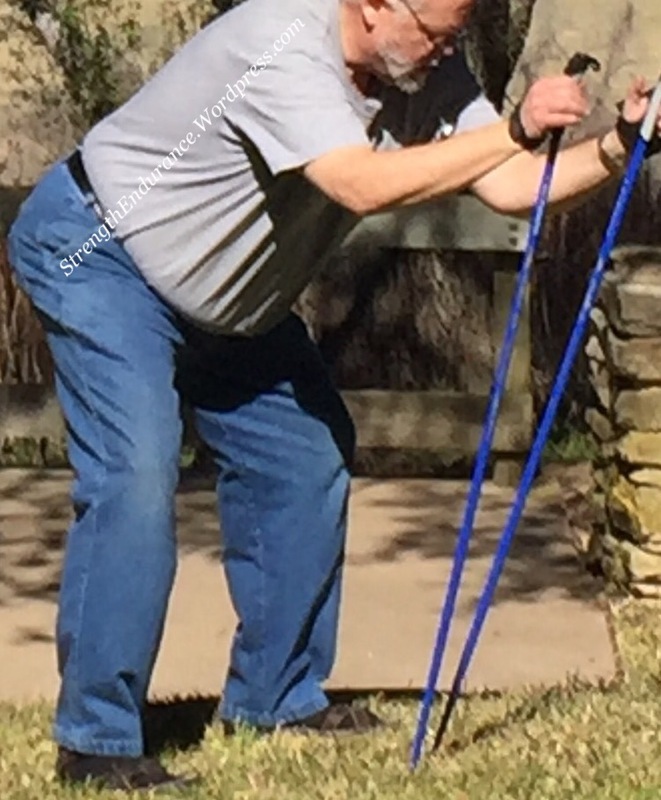 What other Longstrength exercises do you see as possible using Nordic Walking Poles? If you’re doing Nordic Walking here’s a Facebook group to post your workouts! Just when you think you’ve seen everything in the Nordic Walking field – something new catches your attention. In this case it occurred on interstate 10 on the road to El Paso at a rest stop! 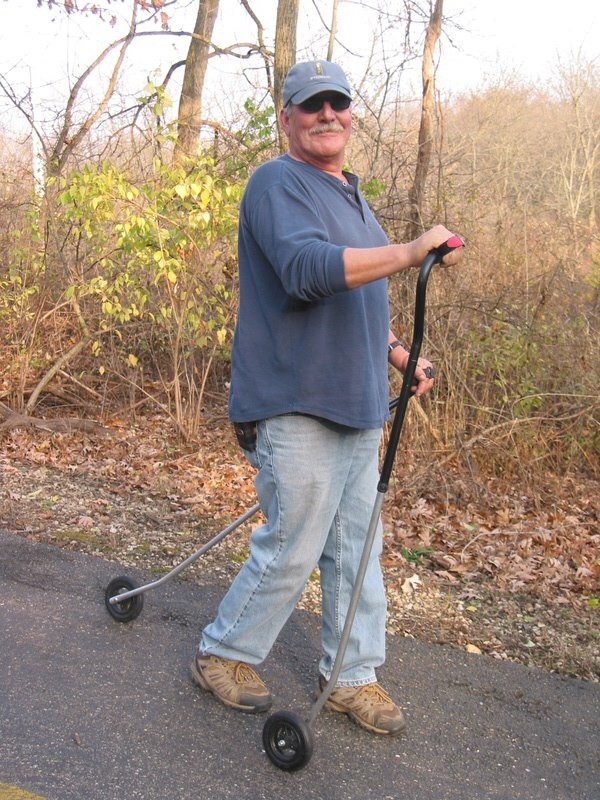 I met the Tim Affield, inventor of Nordic Walking Roller Poles on his morning walk (pictures below from his website but you get the idea)! I was fascinated to learn about his unique Nordic walking adaptation and thought you might be too! My SWIX Nordic poles are fixed length with carbide tips covered by rubber tips.I use one of the other depending on where I’m walking. Mine also have special “hand straps” so I never really have to grip the handles with my fingers. The instructions say to simply press back with the heel of the hand. Instead of carbide tips or rubber “shoes” these devices have one way locking “ratchet” wheels. Press back on the poles and the wheels lock and dig in like the regular Nordic walking poles. These roller poles are adjustable in length the way medical devices like crutches or walker are. That’s different than adjustable Nordic or Trekking poles that have a twist lock. If I were using an adjustable pole, I’d definitely feel more secure with those used for medical devices! My poles are designed to be used mostly with a straight arm movement that starts at about the height of a “handshake” and moves back. Tim’s poles were adjusted longer and his motion began from a bent arm staring with a “triceps extension” movement. Likewise the handgrips place the hand palm down for ergonomic reasons. I wasn’t familiar with the reasoning but have held my hands like that with my straps on my poles and it works very well and seemed to remove some strain I had in the heel of my palm during fast poling. With the hands in this position it’s almost like “crawling” without getting down on all fours! I wondered how well the wheels work. Tim says they work on all terrain and haven’t worn out after 3000 miles! Anything has got to be better than the rubber tips – they can cost $10-$14 to replace (including mail) and don’t last long. Mine are worn out after less than a year and I do lots of other things besides Nordic Walk! I didn’t get a chance to test them myself but I’d like to sometime – their price point is higher than my sticks so that probably won’t happen for a while! It sure makes me wish I could replace my rubber rips with one way locking wheels though! And I’d really like to test them compared to other Nordic Poles! I hope we see a lot more of them in use! Poll: If Pan-X could be manufactured in the near future (2016) along with an instruction manual and DVD instructional, possibly even with Dr. Schwartz performing Pan-X, would you consider purchasing a Pan-X? Here’s what this poll is asking about… Dr. Schwartz’ “Pan-X” or “Strength Endurance Exercise Device” as pictured on this page. Here’s a sample workout using a therapist’s walker as a substitute to give you some ideas. A real Pan-x machine would be more sturdy and not only allow dipping, but also have a higher cross bar for pulling up. Your participation is very important. I for one would like to see this project go forward! Hey, if there are FEATURES or PRICE RANGES that would affect your decision, PLEASE leave your thoughts in the comment section. PS The blog owner has no plans to build or market these devices. Someone who might want to asked me to post this poll however. This article at Men’s Fitness fit my topic earlier today about “Walking and Squatting“. It fits the basic definition of walking and squatting, but it’s at a heavier weight than what I described earlier because I was referring to HeavyHands. This involves a heavier but submaximal squatting weight. Shouldering the weight, the athlete walks 10 meters (or across the gym) and does a set of squats. After the last squat, another walk with the weights is done, then another set of squats, Etc. The exercise involves a huge amount of muscle. Is it panaerobic? I’ll leave that for you to decide… I’d assume it would be MORE likely “panaerobic” if some upper body work were done… Some overhead presses, some push presses, or jerks possibly. Of course it might be easier if these were front squats…or done with Dumbbells or Kettlebells at shoulder height. However you do them, they could be another way of adding walking and squatting to your routine.